The hockey season may have just begun, but as hockey fans ourselves, showcasing our passion for the sport lasts all year long! Perhaps you’ve saved the tickets that brought you to a hockey game each year, or a jersey signed by your favourite hockey player, visit us for options on preserving these memories for years to come! 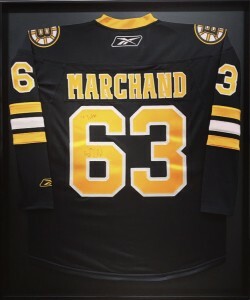 Framing hockey jerseys has always been a popular service here at Kennedy Picture Framing and we always seem to have a few on the go all year round. When handling jerseys we pride ourselves on providing a technique that ensures both presentation and preservation. As each jersey is different in shape, size and dimension, a custom form must be made for each one using conservation artcare foamcore. We then pin the jersey to this form using stainless steel pins in order to ensure that the jersey is preserved for collectibility – as many of the jerseys we frame are signed by our hockey heroes themselves – others have much sentimental value. Either way, we ensure that each jersey is framed to be preserved, and that the technique we utilize is completely reversible. The custom form is then sewn to an archival matboard in the colour of your choice. We then build a box around the entire jersey to allow airspace between the jersey and the glass. The project is completed with glass and a frame, and then wired and ready to hang! Little insider scoop, we are huge Toronto Blue Jays fans (go Jays go! ), thus, we do not limit our jersey framing to just hockey! Maybe you have a Jay’s t-shirt, or a football jersey you would like to showcase in your home or office – feel free to stop on by and see what options are available for your sports memorabilia!